Journey into the twisted mind of Green Bay’s notorious Gags the Clown! In what has become a common headline across the globe, a clown has been roaming the streets of Green Bay at night, capturing the attention of the entire city. Many write it off as a harmless prank, others aren’t so sure. But when a group of friends cross paths with the clown everyone calls “Gags”, his true intentions are revealed. 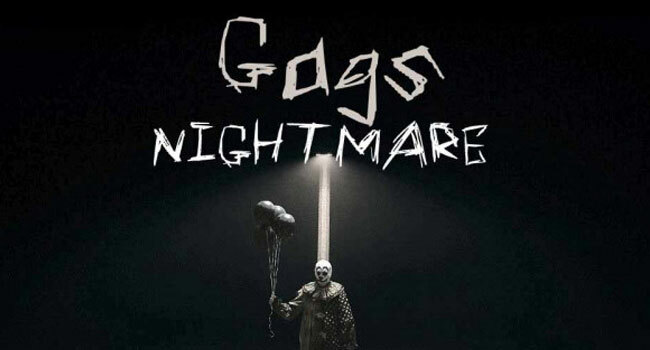 Gags’ Nightmare is a theatrical event unlike any haunted house you’ve ever been to. Opening this October in downtown Green Bay. Climb inside the world of Gags the Clown and truly live his Nightmare. Gags first appeared in the streets of downtown Green Bay about a year ago. He quickly rose to being a national icon with a large following. The feature film will be released in the fall of 2017. Proceeds for the event go towards helping The Production Farm. An organization that gives youth in foster care opportunities to succeed. Get tickets to Gag’s Nightmare here. How was your experience at Gag’s Nightmare?